I did a little more work on the vintage applique quilt kit. The kit instructions included a list of DMC embroidery floss to use for the applique. 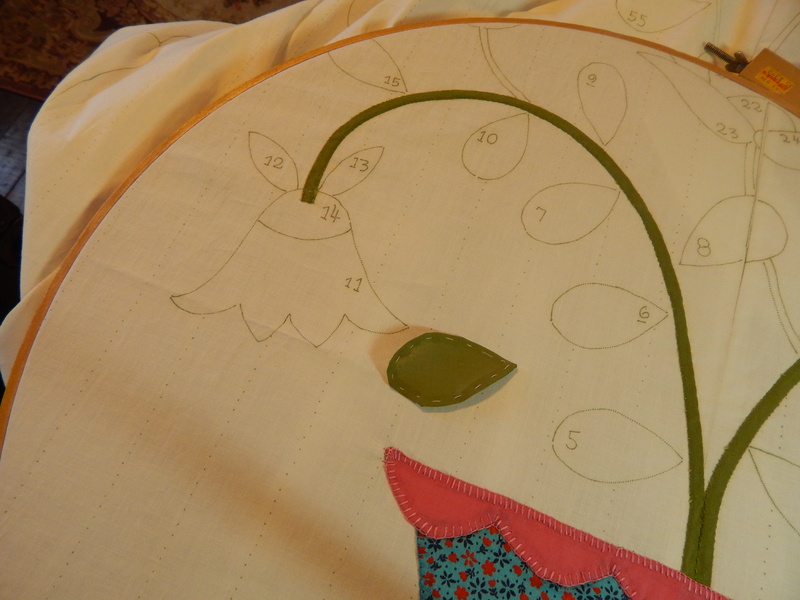 The instructions were to use one strand of floss to do the applique with a blind stitch. I decided to use 2 strands and use a button-hole stitch. It is difficult to turn the edges under and stitch the piece down with a button-hole stitch, but I don’t like to do raw edge applique so I am turning the edges under and basting them first. The pieces are all numbered and the top has a numbered diagram as well…..so it is easy to find where the pieces need to go. 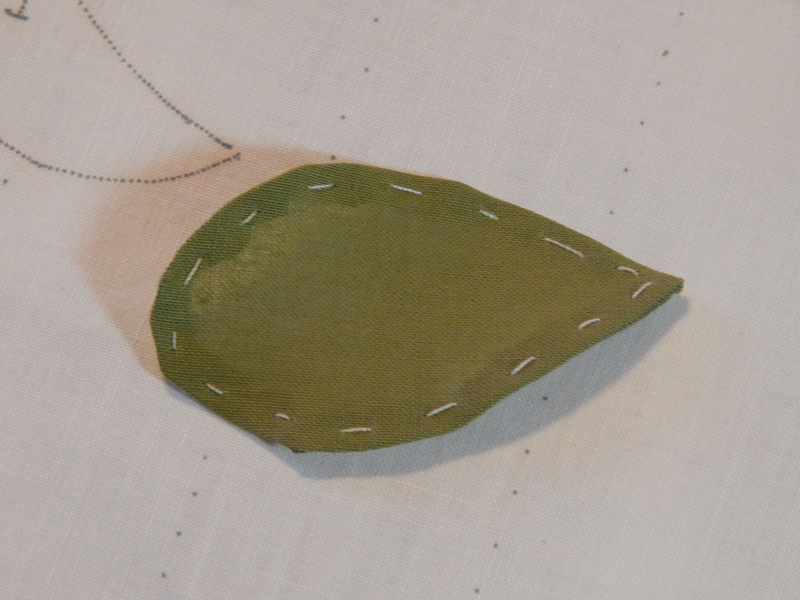 This is number 5.
here are some more leaves added….I take out the basting thread after the button-hole stitch is done. I still have a good amount to do, but it is going a lot faster than I expected and I am already getting excited to do the hand quilting on it. I think I might do the quilting with light blue thread. *wind Chill Readings Will Occasionally Reach 15 To 20 Below Zero This Morning. * Frostbite Can Occur On Exposed Skin In Less Than 30 Minutes. This entry was posted in Quilts and tagged applique quilt kit, P&B textiles, Quilting, Quilts, vintage quilt kit. You’re inspiring me to drag out those big floral fabrics I’ve got stashed somewhere. can you glue the edges of those little green leaves under? or is it faster to baste? I normally take my appliqué on business trips and work on them in the hotel during the evening. I could glue them, but I find this faster and much less messy,(some would disagree and do beautiful work with glue) and glue makes the fabric really stiff and harder to get the needle through…. Tim, Your work never ceases to amaze me! Looks good Tim! You have really kept the vintage feel. 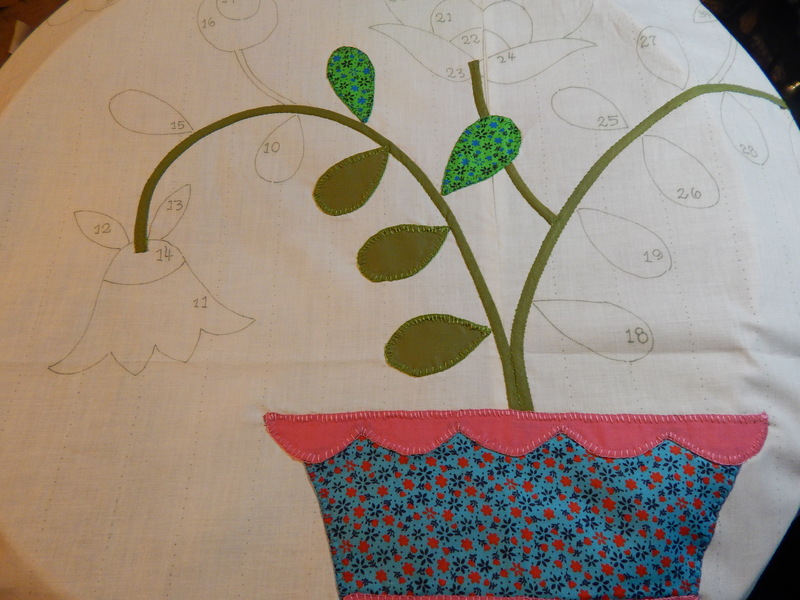 For someone who doesn’t like applique … Is sure doing a lovely job of it! Those are some cold digits ! Brrrrr!! Hi Tim (and Teddy, too! Where’s Teddy??) I was wondering about fabric quality? I see these old kits from time to time and I’m always tempted, but worry about how well the fabrics would hold up. Do you ever run into problems, dry rot, mold, etc? 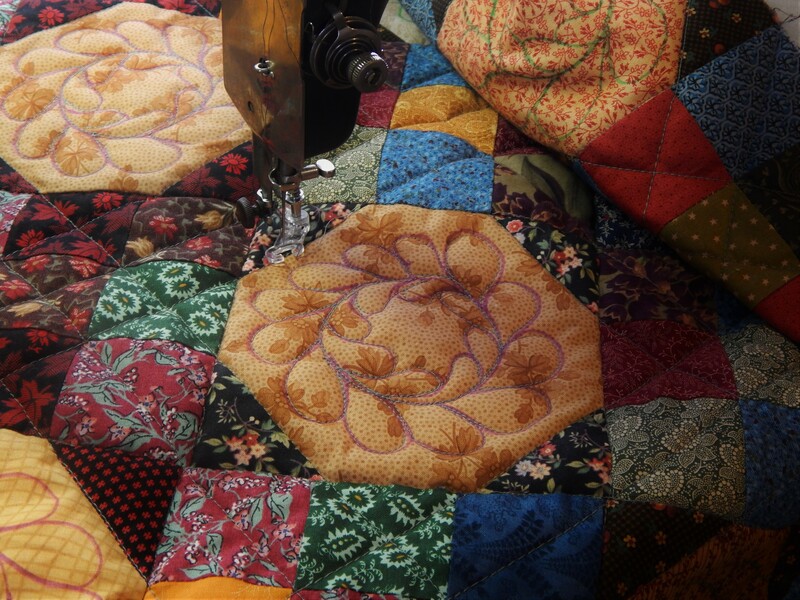 Your quilt looks like it’s lots of fun to work on! I can’t fathom those cold temperatures. I just checked my outside thermometer and it says +48 degrees….brrrr. Going to check out the thrift stores and see if I can find any antique quilts. Hugs to Teddy! 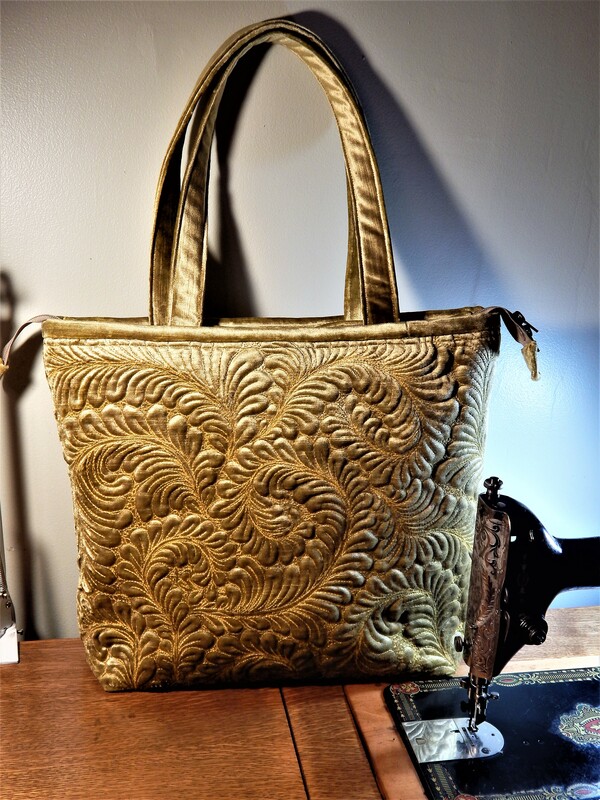 Thanks for posting your applique stitching. It is looking good. I get a real sense of acheivement on each applique piece. It makes me happpy. I also like your Fantasy Garden. It is so bright and cheerful. I will have to ditto what Kathleen Campbell says. 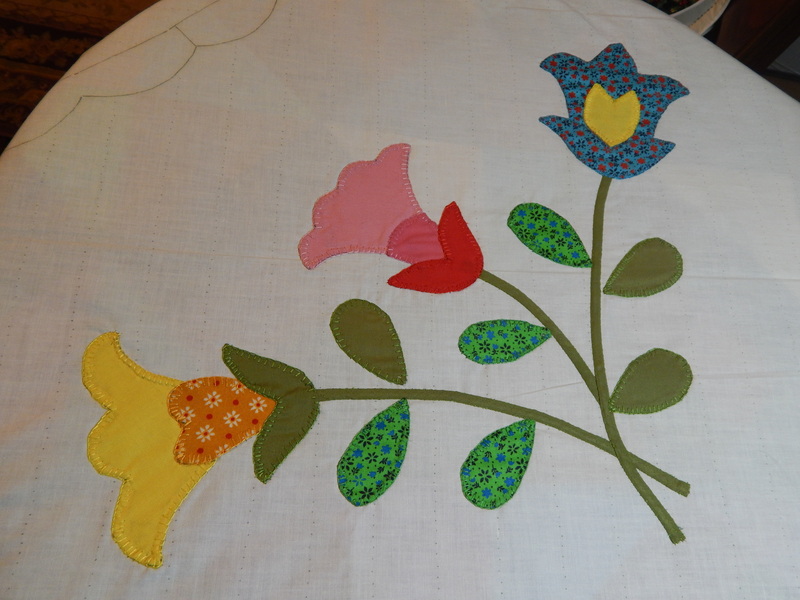 Also applique was on my “to learn list” last year but didn’t get around to it. 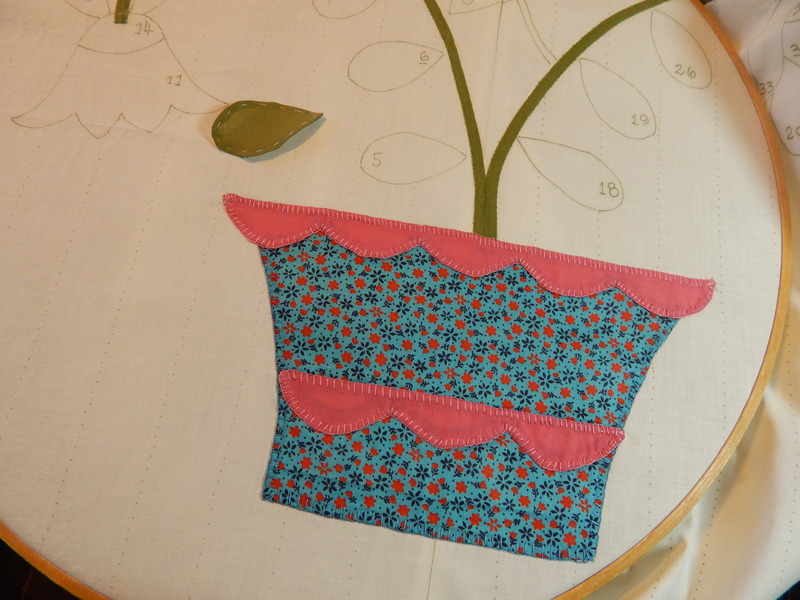 Are you using your hoop when you applique? 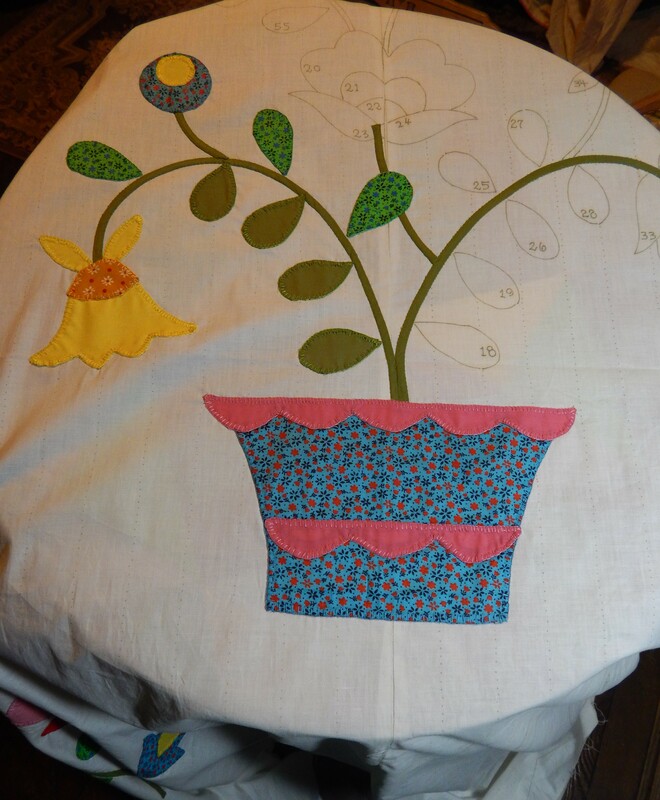 I do a fair amount of applique with some vintage kits and have never used a hoop. 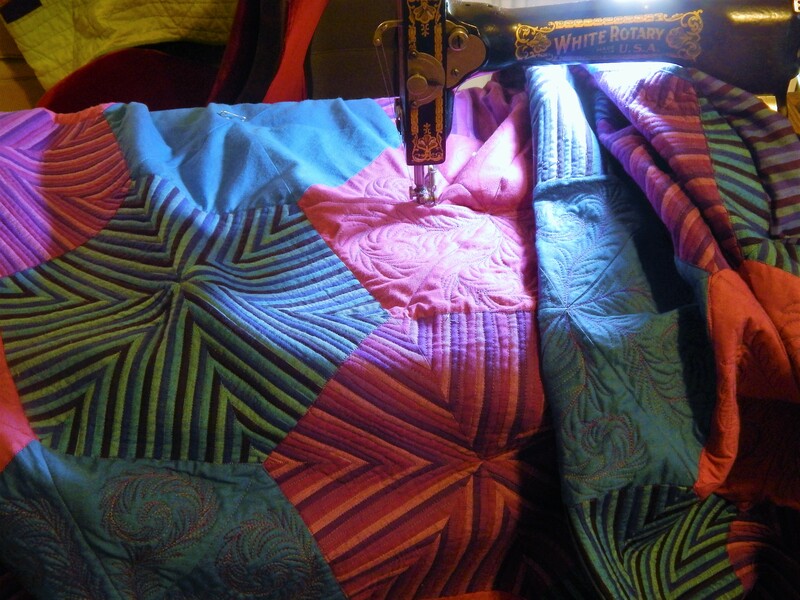 I do struggle sometimes with the volume of fabric when I’m working closer to the center of the quilt. squares (18″ square) which I am going to make 9 of and then sew into a quilt top, tho I am a little nervous about the quilt-as-you-go connecting them when I am done quilting each of them. 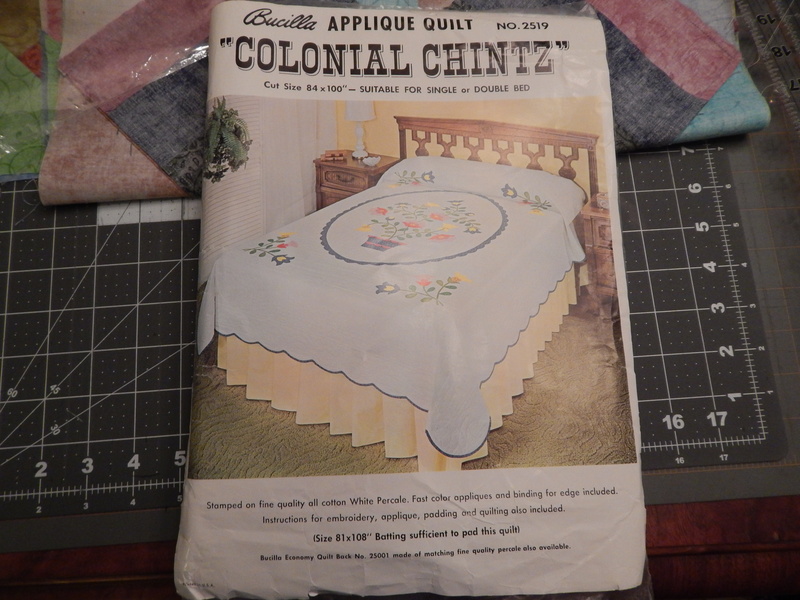 I have never assembled one after quilting it. Wish me luck! Any tips? 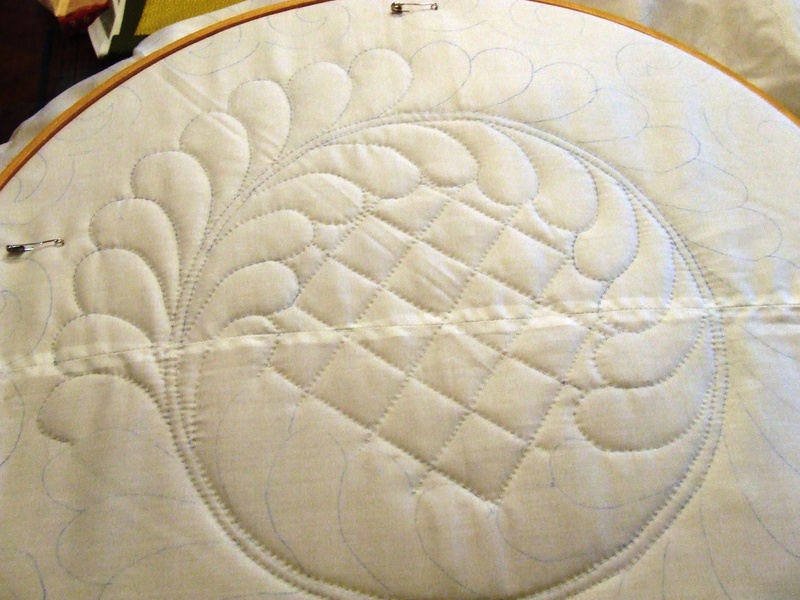 I use YLI on most of my quilts, usually white of off white, I will probably use perle cotton to quilt this one. I really like the button hole stitch on your applque. It ‘fits’ this quilt. After seeing this kit, I might consider getting one from ebay. Sounds like you are having Alaska weather. You may need some dog booties for Teddy! when I was doing hand applique (just piecing blocks now, by machine) I would use a complimentary thread color to the piece I was adding to blind stitch it in place, THEN go back and blanket stitch it. That way if the embroidery floss ever wore out, the piece would still stay in place. I would love to have this kit! Your work is beautiful and I enjoy watching.